iPhone IMEI Check: Why should I treat a used iPhone as a used Car? I understand that this comparison may seem strange at first glance, but checking a used iPhone has many similarities to checking a used car. There are potential problems that are not visible with a quick look. In the case of a car, there may be problems with the engine, the electronics, the gearbox, the brake disc and more. Some of these problems, if you have experience in cars, can be identified by taking them for a test drive. Unfortunately, a lot of them have to be checked by a specialist with great experience (Car Engineer). The same is true for iPhones, since there may be problems that are impossible to be found by a non-specialist. The most common ones are the SIM-Lock status, the Network that is locking your iPhone, whether it’s stolen or lost, if it is in a contract with a provider, if there are unpaid bills or if it is iCloud Locked. As a car engineer is able to find all the problems of a used car, so a company that specializes in iPhone IMEI Check services can find instantly and accurately all the problems of a used iPhone. Why you should use the iPhone IMEI Check services of an expert? Of course, it is a personal choice to ask for help from a specialist to buy a used car or iPhone. Buying without consulting a specialist involves many risks. If you are an expert on cars or iPhones, then the margin to make mistakes or being deceived is reduced. But if you do not have a special knowledge of the subject (To this case, on iPhones), then asking for help from an iPhone IMEI Check company or a car engineer will rule out the possibility of buying a product that will have problems. 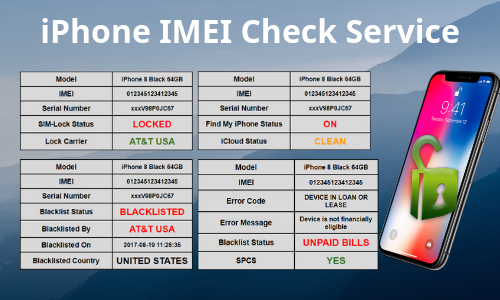 What an iPhone IMEI Check service will provide you? An expert on iPhones or cars will look deeper. As an engineer will open the car’s hood and connect his troubleshooting device to see if everything works well (Mechanically and Electronically). So will an expert on iPhone checking. The only difference to the iPhone IMEI Checking Expert is that he does not have to have the iPhone in his hands, because it can make a full IMEI Check remotely. Just like the engineer will be able to find out by opening the car’s hood if it has a problem with the engine, its overall operation, its electronic systems, etc, so the iPhone Expert through IMEI Checking can find potential problems and solutions. When you think about it, it looks very much like a Service Report by an engineer who explains what check has been done to your car and what the results are. It is not possible to have knowledge of everything, which means that asking for help from experts on issues you do not know is often necessary. The car engineer can tell you for sure if it is worth buying a used car, or how much extra money you will need to repair it. An iPhone Expert will tell you immediately what problems an iPhone has, if you can use it, what limitations it will have and how much it will cost you to unlock it. For this reason, we believe that checking a car by a mechanic is similar to an iPhone IMEI Check service. In order to be 100% sure of an iPhone’s status, the iPhone IMEI Check service is your only solution. This article was posted in IMEI Check and tagged IMEI Check services, iPhone IMEI Check, iPhone IMEI Check Experts, iPhone IMEI Check services, iPhone IMEI Checking.